A peek inside this fashion illustrator's unbelievably colorful world. by LAUREN MCGRATH· 10/28/2015, 1:53 p.m.
Styled from head to toe. | Lauren McGrath. You’ve probably seen her around town – bespectacled Denise Fike, always dressed to impress and peeking out from underneath one of her brimmed hats. Who wears hats anywhere besides the Kentucky Derby? Denise Fike does. And you know what? She does it impeccably. 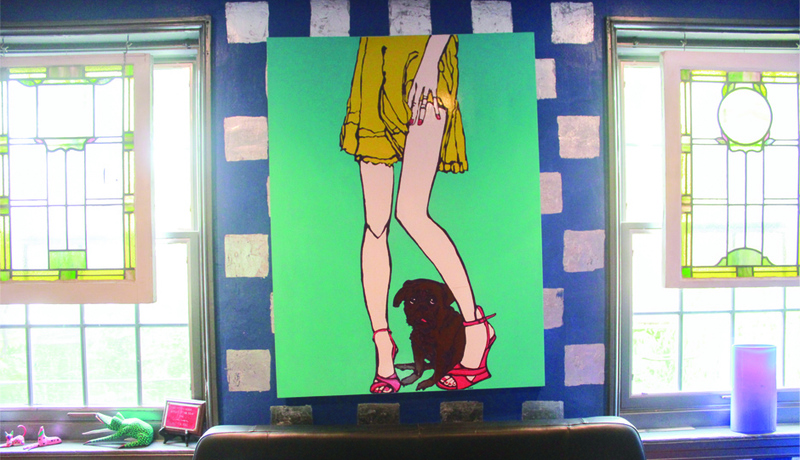 She is Philly’s coolest fashion illustrator who, if you’re lucky, has drawn you at one swanky event or another. 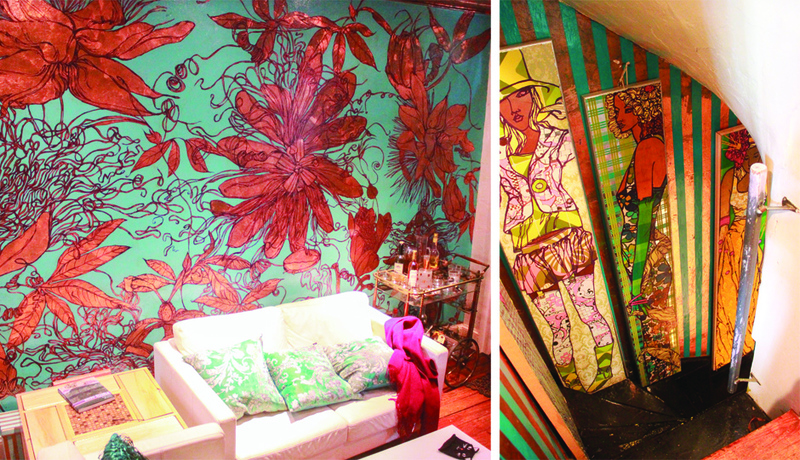 We got a peek inside her wonderfully kooky, colorful home, where nothing quite hangs straight and nobody gives a damn. Here, Denise dishes on her style philosophy, the toughest thing to draw, faking your way to the top, and what to do when you find yourself at a NYE party at a gay club wearing the same dress as the man next to you – and he looks better. Attention to detail. | Lauren McGrath. What’s your uniform?A hat, a black skirt – for the winter, a black tunic – a pair of boots, and earrings. It used to be high heels, but now just really cool flats because of the [grandkids]. I have to have these readers, either in turquoise or magenta. One of her hat rooms. (There are multiple.) | Lauren McGrath. So what’s with all the hats? Right after I gave birth, I couldn’t go in the sun anymore; I couldn’t believe it. But then it became such a thing that now people don’t know me without the hat. The most wonderfully varied library I’ve come across. | Lauren McGrath. How about those awesome shoes? I wore high heels all the time – I would walk from here to Drexel in high heels. Then with the kids, I had to [start wearing flats]. I love Jeffrey Campbell shoes. You can wear flats and not worry about it, not look like an old grandma. 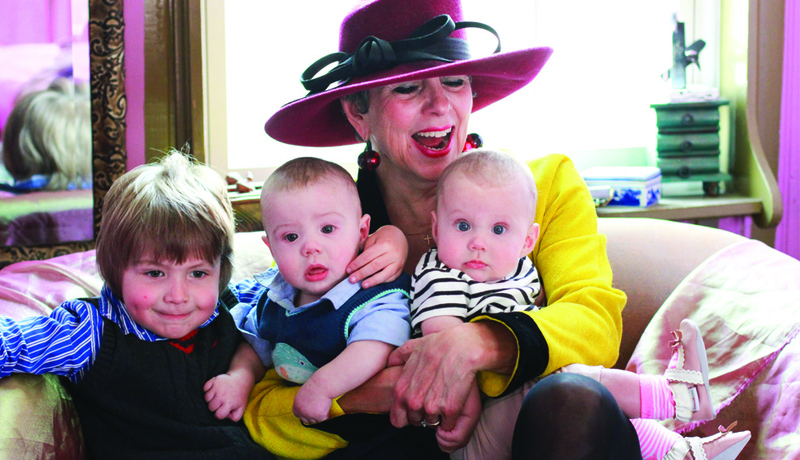 Denise with her three grandchildren outside her home. | Lauren McGrath. What’s it like being a fashion illustrator? It’s fun. I actually never thought I could do it because I’m very private when I work – that’s why I tend to wear the hats. I really have to look at you, and its kind of intimidating. Everybody seems to like [my illustrations] so much, and it’s just so much fun. It took me a little while to get started, but now I can do a drawing in 4.5 minutes. She’s painted nearly every inch of her home. | Lauren McGrath. Were you always drawing stylish people at parties? I studied fashion illustration, fine arts and commercial art at Moore. I left in 1974 when everything became photography [focused]. I had visions of being the biggest fashion illustrator in the U.S., and it wasn’t going to happen. I worked at a fabric store on Walnut, and I was like this is … not fun. So I went to Alaska on a holiday, and I almost died three times. I thought I could do anything; it was the most amazing trip of my life. I came back, and I said, “That was life. This isn’t.” So, I quit my jobs, built up a new portfolio and started getting lots of work. I illustrated some books; I [designed] custom wallpaper for children’s hospitals. The first time I did leaf, like the ceiling and the wall (shown above), was for Wilmington Trust Bank. I said, “Oh I can do that!”… I never did that. But that’s what you always do – you say “Yes I can,” and then figure it out. Moore hired me to teach; that’s when I started doing the long fashion paintings and illustrations. “My husband is a good sport,” Denise says of their pink bedroom. | Lauren McGrath. I tend to get things on sale because nobody else wants them. I always look for something a little more offbeat. I don’t care if anybody likes it; I like it. That comes with age. Details of Denise’s hat room and bedroom. | Lauren McGrath. My mom, Wanda Cavalieri, is my style maven. She always wore a hat, was always stylish. She would always say, “Stand up straight; watch how you’re walking.” She was stunning. Nicole Miller dresses and a thrifted men’s tuxedo are some of her favorite items. | Lauren McGrath. What are your favorite places to shop in Philly? Joan Shepp and Nicole Miller and eBay. eBay is like sniping. I like [finding] Karl Lagerfeld vintage jackets. Vintage Chloé jacket. | Lauren McGrath. What’s your favorite memory associated with clothing you own? I wore this beautiful gown to a New Year’s Eve Party at a gay club. We were dancing up a storm [when I noticed] the man next to me had the same dress on – and he looked better in it. I told him so; he shrugged, and then we danced together. Christian Lacroix dress. | Lauren McGrath. How does the mind of a fashion illustrator work? You’re always looking at people on the street thinking, I gotta draw you. I go up to people and say, “I know this is weird, but I love the way you look. Can I draw you sometime? You put yourself together really, really well.” But then there’s the other extreme, where I sometimes see people and think, How could you walk out of the house in flip-flops?This is town, for God’s sake; you wear them when you shower in a hotel room! You’re a little more critical of people’s clothes. One of her many paintings. | Lauren McGrath. What’s the hardest thing to draw? Men. They’re more vain than women. And the hardest thing for me to draw is a bald headed man. If you go in just a little bit, it looks like he has a hole punched in his head. There’s no fixing it; you can’t cover it up with hair. The grandkids keep her laughing. | Lauren McGrath. Any words of style wisdom for women out there? When you leave the house, dress like you are going to meet the President of the United States. Always dress like you’re happy with yourself, like you’re trying to impress – even [if it’s just to] impress yourself.